Today, Valentine's Day, Graham and I did not exchange chocolates or flowers. We are not booking a babysitter and going out on a date. We're having spending the evening with our kids, checking out the valentines they got from their friends and making chocolate-covered strawberries. After they go to bed we're getting some Indian takeout and probably watching American Idol. Are the kids cramping our style? Nah. After all, if Valentine's Day is about love, what greater love is there than the love of a parent for a child? I've already written on SV Moms Blog about why I love Graham. 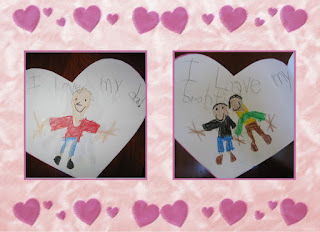 But Valentine's Day wouldn't be complete for me without saying something about the love I have for my kids.